Spartathlon is a 153 mile (246km) ultramarathon race held annually in Greece since 1983 and takes place between Athens and Sparta. The Spartathlon race aims to trace the footsteps of Pheidippides, an Athenian messenger sent to Sparta in 490 BC to seek help against the Persians in the Battle of Marathon. Pheidippides, according to an account by Greek historian Herodotus in The Persian Wars, arrived in Sparta the day after he departed. Herodotus wrote: “On the occasion of which we speak when Pheidippides was sent by the Athenian generals, and, according to his own account, saw Pan on his journey, he reached Sparta on the very next day after quitting the city of Athens.” Based on this account, British RAF Wing Commander John Foden and four other RAF officers travelled to Greece in 1982 on an official expedition to test whether it was possible to cover the nearly 250 kilometres in a day and a half. Three runners were successful in completing the distance: John Foden (37:37), John Scholtens (34:30) and John McCarthy in (39:00). Dave Ireland of Birmingham Runner was part of the crew as was a very young Nick Papageorge. The following year a team of enthusiastic supporters (British, Greek and other nationalities) based at the British Hellenic Chamber of Commerce in Athens and led by Philhellene Michael Callaghan organised the running of the first Open International Spartathlon Race. From 1984 the International Spartathlon Association was founded, which since then has continuously organised the race each September. The choice of this month is because that is the time reported by Herodotus for Pheidippides’ run to Sparta. Described as the world’s most grueling race, the Spartathlon runs over rough tracks and muddy paths (often it rains during the race), crosses vineyards and olive groves, climbs steep hillsides and, most challenging of all, takes the runners on the 1,200 meter ascent and descent of Mount Parthenio in the dead of night. This is the mountain, covered with rocks and bushes, on which it is said Pheidippides met the god Pan. In 2,500 years man has had no impact at all. There is still no pathway over the mountain that is swept by strong winds with temperatures as low as 4°C. The ascent is marked out by a trail of battery-driven colored flashing lights and its challenge is a trial for human stamina and mental strength. Over the mountain the last sections are no less energy sapping and exhausting for the runners as they follow a road that winds up and down hills before descending into Sparta. Even the finest athletes may start hallucinating as they cover these final stages. Having lost all sense of time and reality, they are “on automatic” as they push their weary bodies on towards the finishing line at the statue of Leonidas. Only about a third to a half of the runners who leave Athens end the course in Sparta. The goal of all participants is to cover the course within the 36-hour time limit. Those who succeed in reaching Sparta have trouble finding words to describe their feelings. Spartathlon has to be lived through. It is a very personal experience in which the athletes dream about participating. Their imagination is stirred by the idea of being a modern day Pheidippides, running in the footsteps of the ancient messenger. They train for years to get fit enough both physically and mentally to meet the race’s demands. 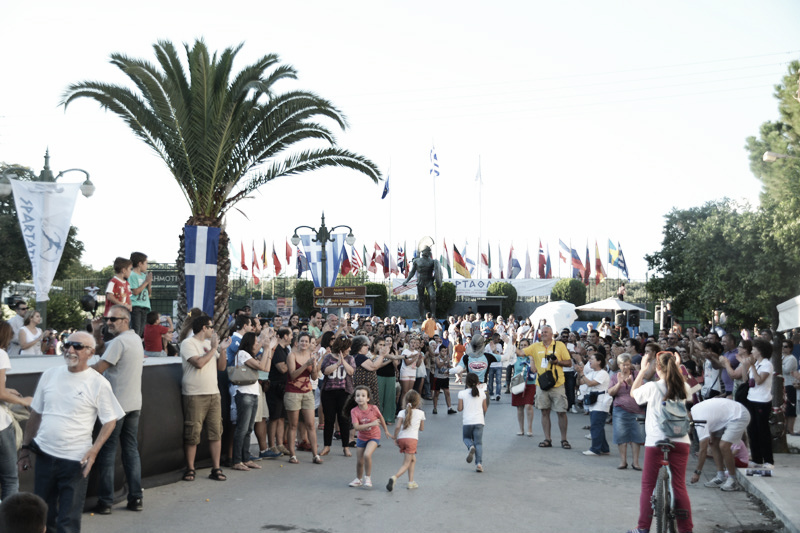 The race starts at 7:00 am, usually on the last Friday of September, at the foot of the Acropolis. It runs out of Athens toward the coast and along the coast towards Corinth via Elefsis, Megara, and Kineta. The route reaches the Corinth Canal at 78.5 kilometres and the runners hit the first of six major check points at 81 kilometres. After Corinth, the race heads toward Ancient Corinth, Nemea, Lyrkia, and at 159 kilometres reaches the top of Mount Parthenio. From there, it continues south toward Nestani and Tegea, before reaching the main Sparta highway just before the 200 kilometer mark. Runners must pass through 75 checkpoints along the way and each checkpoint has a cut-off time. Runners may be pulled out of the race when they are either outside the time limit or if they display extreme fatigue. In order to run in this race an individual must meet certain entry qualification requirements. Athletes who meet these requirements will be entered into a ballot for a Spartathlon place. However, athletes with a performance at least 20% better in one of the entry requirements will automatically be initially accepted. The number of entrants per country is limited. The United Kingdom presently has a limited 25 entrants for the race. An explanation of the qualification standards are described in further detail in a separate article which can be found from the web links at the bottom of the page. Yiannis Kouros, who won the first Spartathlon, still holds the fastest recorded finish time at 20:25:00. Kouros competed in four Spartathlons, won all four and holds the four fastest times ever recorded. In 2005, he decided to trace the steps of Pheidippides completely and ran—out of competition—the Athens-Sparta-Athens distance. In 2010 Emily Gelder was the 1st Lady finisher as was Lizzy Hawker in 2012 (Lizzy was also 3rd overall). In 2015, British runner Mimi Anderson also completed the Athens to Sparta to Athens double. The fastest time by a British competitor was in 1990 by Patrick Macke. The last British winner was James Zarei in 1995 whilst Dan Lawson came 2nd in 2015. Note: This article was originally written by Rob Pinnington in 2015 and was last updated in 2018.